We are pleased to inform you of the result of The Lottery Winners International programs held on the 10th of November 2006. 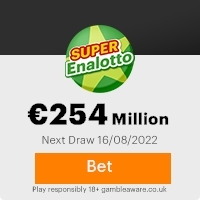 Your e-mail address was attached to ticket number 27511465896-6410 with serial number 3772-510 drew lucky numbers 7-14-88-23-31-45 which consequently won in the 1st category, you have therefore been approved for a lump sum pay of Euro 1,000,000.00 (One Million Euro). Please Remember, all winning must be claimed not later than 22nd of December 2006. After this date, all unclaimed funds will be included in the next stake. Please note in order to avoid unnecessary delays and complications please remember to quote your reference number and batch numbers in all correspondence. Furthermore, should there be any change of address do inform your agent as soon as possible. Note: In accordance with the Lucky Day Lottery policy and regulations, this message is dispatched directly to the recipient only. If you are not the rightful owner of this email address or feel that you have received this message by error, we advice you destroy this copy as you are not authorized to read, print, retain or disseminate any part of it. Previous: CONTACT YOUR CLAIM AGENT NOW!! !Fresh ScamsNext: CONTACT ANTHONY HANS. This Email with the Subject "Christmas Bonanza!!!" was received in one of Scamdex's honeypot email accounts on Mon, 11 Dec 2006 11:10:19 -0800 and has been classified as a Generic Scam Email. The sender shows as claudia@claudiahanks84.orangehome.co.uk, although that address was probably spoofed. We recommend that you do not attempt to contact any persons or organizations referenced in this email, as you may expose yourself to scammers and, at the very least, you will be added to their email address lists for spam purposes.